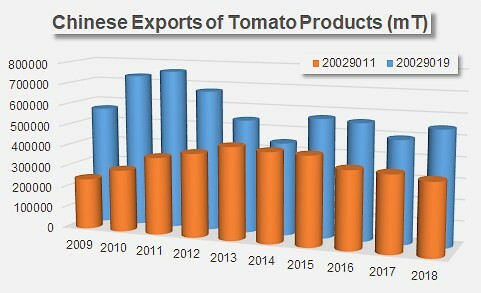 Chinese exports of tomato products recorded a notable increase in 2018: volumes exported between January and December amounted to 888 868 metric tonnes, a progression of more than 4% compared to 2017 results (852 217 mT). 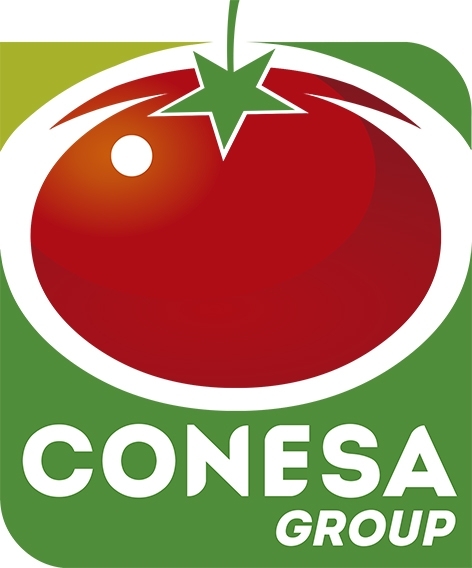 The increase mainly stems from a recovery in operations for the category of wholesale products intended for industrial uses (customs code 20029019), whose foreign sales increased by 56 300 mT (+12%) compared to 2017, and by 8 100 mT (+2%) compared to the average of the three previous years, while shipments of products for the retail market (customs code 20029011) respectively lost 20 100 mT (-6%) and 43 000 mT (-11%) compared to the same time frames. Although the Chinese industry's results for 2018 represent a 36 600 tonnes improvement over 2017, they nonetheless confirm the downward trend that has been affecting Chinese dynamics since the 2011/2012 marketing year. In terms of markets, several of the regions that have traditionally been major drivers of the Chinese industry spectacularly reduced their purchases of Chinese products last year. In West Africa, imports to Ghana (-33 100 mT), Benin (-40 000 mT) and Côte d'Ivoire (-9 500 mT) dropped sharply in 2017, unlike those to Nigeria (officially published once again after several years of interruption), which recorded a spectacular increase (+47 000 mT), giving reason to believe that official trade results have recently taken the place of at least part of the previously informal trade flow to this country, which was considerable. 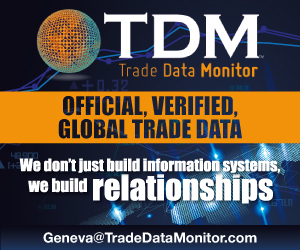 Imports to Senegal and Cameroon also dropped sharply, with final results indicating that 2018 tonnage shipped to West Africa has been almost 38 000 tonnes lower than it was for the period running 2015-2017. 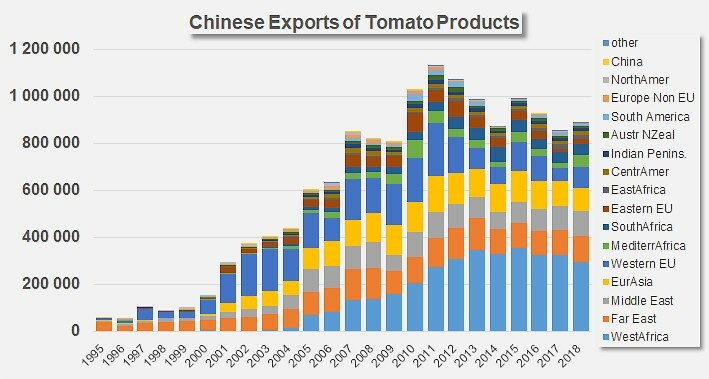 Compared to the 2015-2017 period, China's foreign sales also dropped noticeably in 2018 on the markets of Russia (-23 500 mT), Japan (-3 600 mT), Argentina (-4 400 mT), Poland (-3 900 mT), Britain (-3 500 mT), Indonesia, etc. The increases recorded for imports to Algeria (+17 700 mT), Saudi Arabia (+5 100 mT), the Philippines, Sudan, Haiti, Togo and Italy (to only mention the most notable countries) have been insufficient to compensate for these big drops in performance. Comparative evolution of annual quantities processed and exported (estimation, expressed on a raw product equivalent basis) by the Chinese industry. After a high point reached during the 2009 harvest, processed volumes dropped sharply to an average level of close on 5.8 million mT over the past four seasons. 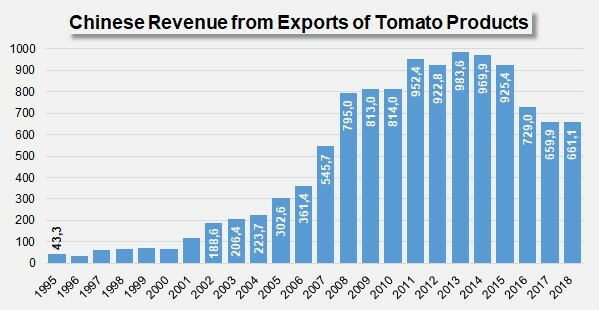 At the moment, 2019 forecasts have been stated at 3.8 million mT, a noticeable retraction that is likely to lead to a reduction in the volumes of exported products.